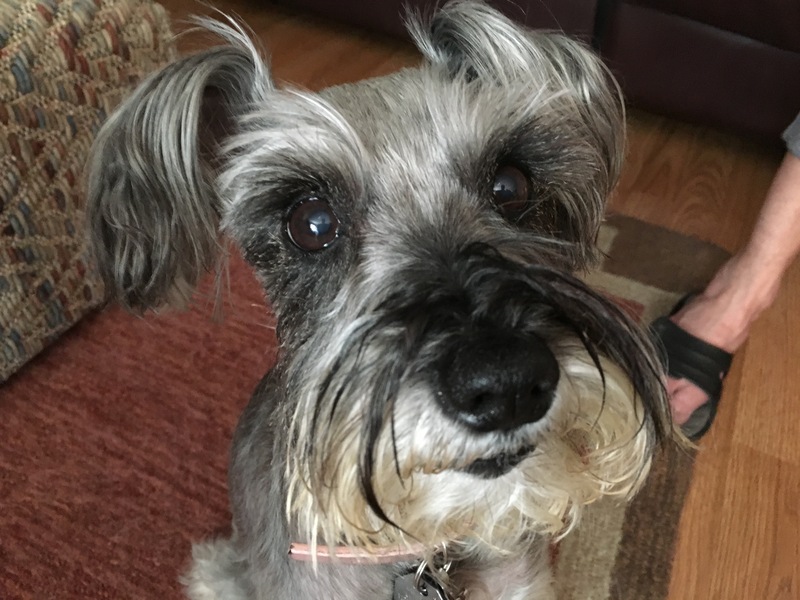 Yentle is a nine-year-old Miniature Schnauzer who lives in Larchmont, Los Angeles with two other dogs. Her guardian contacted me to help stop her over barking, especially when left alone at home possible due to Separation Anxiety. But the main issue her guardians wanted help with was Yentle’s case of leash aggression when seeing other dogs. When I arrived for the session, Yentle was more excited that the other two dogs she lives with; jumping up on her guardian and myself. I suggested in the future that the guardian disagree with her before she jumps up. Disagreeing with a dog BEFORE they do something is always the most effective approach. On those occasions where she manages to get up before they can stop her, immediately correcting and getting her down is imperative. Jumping up on a human is indicative of a dog who does not respect her guardians as authority figures. When I sat down withe her guardians to discuss the situation, I learned that the dogs didn’t have many rules in place. While this is fine for many dogs, when you have multiple dogs living together, a lack of rules can confuse a dog into thinking that there is a leadership vacuum. This lack of structure can impact an unbalanced dog and after our discussion I concluded that adding some simple rules into her day to day life may have a positive impact on her behavior. If she feels that her guardian has a situation under control, then she may be less inclined to try to sort if out herself. One of the other suggestions I made was to adopt a technique I like to call Petting with a Purpose. By asking Yentle to do something for her guardians before she gets attention of affection, the humans can help the dog develop respect for them as authority figures. This will take a few days to a week for the humans to completely adopt this technique, but once they do, they will help deepen the dog’s respect for their authority each time they pet her. I recommended a few rules and boundaries that will also help Yentle start to see and identify her guardians as authority figures instead of peers. While this was not the core problem for Yentle, identifying her guardians as the authority figures helps many dogs learn that they do not have to handle things on their own. Now that we had addressed the leadership / peer dynamic we were ready to tackle Yentle’s leash reactivity issue. To help me be a better Dog Behaviorist, I order books on different dog behavior problems. I have a stack of them at home and often leave them on the shelf until I have a client with a related problem due to how busy my schedule is. Another resource I have are other dog behaviorist and trainers. A few years ago I was fortunate to connect with a certified Dog Behaviorist named Karen London. She is probably the closest thing I have to a mentor and is who I reach out to when I have a problem I can’t figure out or need advice. I mention Karen as I had ordered a book on Leash Reactivity called Feisty Fido, Help for the Leash Reactive Dog a few months ago but hadn’t yet read it. But with a few LA clients with this issue, I pulled the book off the shelf. When I did so, I noticed one of the author’s was the very same Karen London (along with Patricia B McConnell). I used the technique that Karen and Patricia recommend called the “watch.” The general idea is to condition the dog to look at their handler’s face when they see an approaching dog. Hopefully Karen will feel that I did her justice in the above video. While redirecting the dog’s attention seems like a super simple solution, its quite effective. Now there is quite a bit more to the book than what I covered in the above video so I strongly recommend anyone reading this who has a leash reactive dog to order Karen and Patricia’s book. Its easy to read as it is to apply the techniques. Best of all, it works! By the end of the session, Yentle was already responding to the Petting with a Purpose by sitting in front of whoever she wanted attention from instead of jumping up or pawing at them. Its going to take practice at the “watch” command on the dog’s pace. At first they should stick to practicing the technique inside until the dog looks up at her guardian on command. The next step will be to practice in a slightly more challenging location like a walk or an outdoor venue with no other dogs around. Once the dog responds the same way outside, then they can enlist the help of a friend with a dog or walk in areas where dogs will be, but at a distance. Eventually the dog will look up at her handler when she spots another dog instead of barking at it. Karen calls this “Auto watch” and its a big milestone for dogs with Leash Reactivity. How quickly the dog gets to this point will depend on how often Yentle’s guardians practice the watch. But given their dedication to their pets, Im guessing it won’t be long before Yentle is auto watching like a pro.